Poll: Americans Understand Online Tracking. And They Don’t Like It. Most Americans understand that their activities online are constantly being monitored. And they don’t like it one bit. New survey results detailing Americans’ aversion to being tracked online could help bolster support for new legislation in Congress to give consumers a “Do Not Track” option when it comes to online advertising. According to a recent survey by Credit.com conducted by GfK Custom Research, three-quarters of Americans are aware that programs on their computers are tracking where they surf online, and simultaneously gathering personal details about them. They also know that these programs are very difficult to disable or delete despite their best efforts, as we covered here and here. 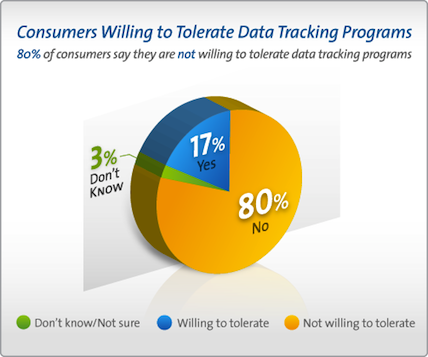 An even bigger majority – 80% – wants the tracking to stop. They refuse to tolerate tracking, even if it means better deals on products they want. A bill by Congresswoman Jackie Speier (D – CA) would help enable consumers to opt out of such online tracking. Introduced last week, the Do Not Track Me Online Act would do for online advertising what the Do Not Call registry did for Do Not Call, giving consumers the chance to block advertising companies from placing tracking software on their computers. 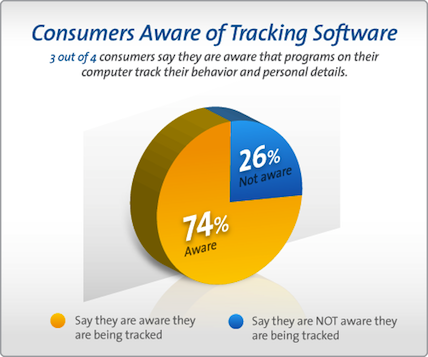 According to the Credit.com survey, awareness of online tracking was fairly consistent across all age groups except for senior citizens. Only 57% of people age 65 and older understand that their activities and personal information is being gathered online. The biggest difference in awareness was based on income. Among people who earn less than $20,000 a year, 60% understand tracking. Awareness soared to 84% among people earning over $75,000. Those in the Northeast are most tuned-in, with 81% aware of online tracking, while in the Midwest the awareness rate falls to 68%. Meanwhile, people of all ages almost uniformly oppose tracking. A third of people making under $20,000 said they can tolerate it, but all other income groups were similarly opposed. This national RDD Probability Sample telephone poll was conducted for Credit.com by GfK Custom Research North America from January 14-16, 2011. A total of 1,004 interviews were completed, with roughly 531 female adults and 473 male adults. The margin of error is +/- 3 percentage points for the full sample.